The model TR55 resistance thermometer is ideally suited for the measurement of surface temperature at bearing shells on pumps, gears or motors under dry ambient conditions at the measuring tip. The spring-loaded, flat measuring tip ensures a constant contact pressure of the thermometer on the outer surface of the bearing shell. The optimum insertion depth can be set by means of a compression fitting. 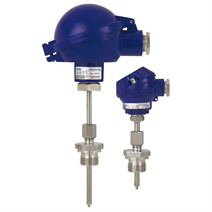 Analogue or digital transmitters built into the connection head are capable of making various output signals available, for example 4 ... 20 mA, HART® protocol, PROFIBUS® PA or FOUNDATION™ Fieldbus.